The Dial are a five/six piece party band playing live music at parties, weddings and corporate events across the south of England. We are all experienced and polished musicians. Fronting our band is vocalist/guitarist Morne Gabriels vocalist. 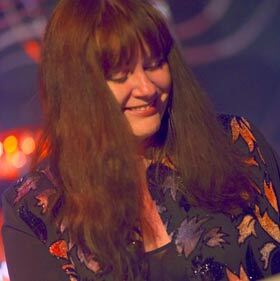 Sharing vocals and playing keyboards is Chelle Free, on guitar we have Steve Freeman, Andrew Lissamore plays bass guitar with Steve Wyse on drums. 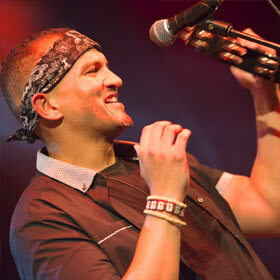 From South Africa, Morne is an impressive and versatile singer/guitarist/songwriter now based in Kent. He comes from a musical family with his parents and uncle performing in a professional three-piece harmony group in which his father played acoustic guitar. Morne grew up listening to pop, rock and jazz music. At the age of 12 he taught himself to play guitar and became part of a church gospel band in Cape Town. 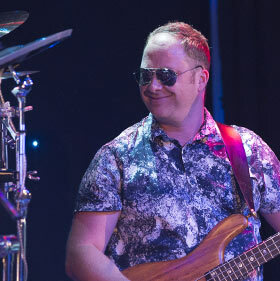 He joined his first semi-professional band playing rhythm guitar and singing backing vocals when he was just 16 before leaving The Cape to come to the UK in 2000 where he joined the Signature touring musical theatre company. Morne was spotted at a music club in Kent and invited to join The Dial. "Playing keyboards and singing for many a year, usually recording sessions for bands and artists with silly names - Started recording and gigging with Kent guitar hero (the late) 'Johnny Shoeshine', much loved and much missed - Toured with 'Join the Dots' - then came home and gigged with countless jazz and cabaret bands. More recentIy I've played with Latin-Jazz band 'The Miggins'... Cruised the Mediterannean, cruised the Caribbean - got quite a suntan - Bless them!" AKA 'The Professor' - Producer, guitarist and sound engineer. 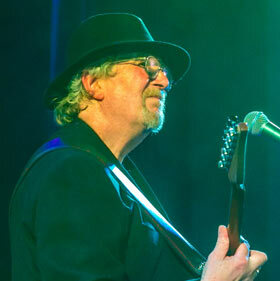 Steve is a true 'studio animal', working on sessions with, amongst others, Level 42, legendary guitarist Albert Lee and Cockney pop duo Chas 'n' Dave. More recently Steve has been Technical Director at Kent's premier music venue: The Mick Jagger Centre. Although you're probably already familiar with the sound of his guitar, until recently Steve had rarely played live. He now runs his own recording studio where you'll find him twiddling with his knobs and playing a multitudinous collection of guitars. Has toured and recorded with groups/artists such as The Originals, Gizmo (prog rock), Judge Dread (reggae), Andy Fraser (ex Free), Arthur Kay (ska), and HPC (modern orchestral) plus a short stint in Sooty's (That's right, the glove puppet) backing band. He's performed at many of the UK's top venues including Glastonbury and the London O2. Followers of the 70's synth band Gizmo will remember him for playing with blazing drumsticks... "The climax of the show was the fire-blowing and the on-stage explosions... The sticks thing? We used white spirit - it'd never be allowed today." 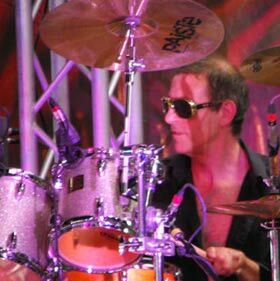 Steve's drumming is to be heard on radio and in elevators throughout the world. Someone once gave me a 50 quid note - It was real!"